Assassin’s Creed II stands as a high point for me in gaming narratives. Subtle, mature, well-written, it’s a game that was both expansive and focused. I play every Assassin’s Creed game hoping they can recreate what II (and by extension, Brotherhood) had, but I’ve become increasingly exhausted by the series. I don’t think we’ll ever have another Assassin’s Creed II, and here are a few reasons why. The narrative has lost its focus. With ACI-III, the Desmond narrative, as clumsy as it was at times, served as a strong frame to help the player relate to the character. ACI had Desmond held against his will as he learned the story of an ancestor who was, in many ways the same, tricked into doing what he was told was right. That interplay made what Altair was going through relatable as it was interpreted by Desmond. In ACII, Ezio’s story of loss and eventual growth as he accepted who he was born to be was the perfect foil to Desmond’s inability to accept his burden. ACIII had major themes of the ramifications of power and the dangers of trust that were present in both narratives. The modern narrative helped not only to focus the story du jour in each game, but it also established an overarching plot that gave people a reason to play the game. With the more recent games, most of the modern story exists because it has to, but does nothing to progress their established narrative. The series is unwilling to follow or end threads. By that same coin, Assassins Creed seems stuck in some kind of narrative limbo where the writers are either unwilling or unable to cut off the dead weight. If they aren’t willing to expand and complete the futuristic aspects of the story, then they should eliminate them. The games can stand fine on their own as narratives with the burden of the modern-day plot. Cut that out and focus on telling an interesting story of an assassin. At it’s heart, Assassin’s Creed is a coat of paint on the evergreen story of good vs. evil. It’s willing to play heavily with our beliefs of what is good and what is evil, but those concepts work in any time period and players can be mature enough to understand those themes without needing a modern interpreter any more. The series stopped caring about its characters. Ezio’s story works so well because we are with him through his personal tragedy and we see how he grows. The game took time to focus on his development and we could see how he was changing throughout the course of the game. With Connor the cracks started to show as the game fast-forwarded through quite a few parts of his life, but his major plot-points and the homestead missions really expanded his character and gave him a place in his world. The later games have mostly abandoned this. Like the modern narrative, characters have become secondary to the action. Edward Kenway was a particularly egregious example of this, with his narrative told through bite-sized cut scenes that were enough to say, “See? He has a reason to be jaded.” Arno had an interesting set-up that was mostly jammed into a brief story spread out across piles and piles of pointless quests. Like the modern-day first person avatar, it seems as if the du jour characters have been reduced and minimized to allow the player to imagine that they are the assassin. The series lost its handle on villains. The first games did a great job with villains. Assassin’s Creed I had a very traditional architecture with Robert de Sable lording over your targets, but that was inverted with the discovery of Al Mualim’s betrayal. It seems inevitable when you replay it, that he is manipulating you. ACII had a great gallery of rogues led by Roberto Borgias that lasted through Brotherhood. Ezio impacted their story and they had results in his. ACIII had Haythem Kenway and Robert Cross who were both deep characters with opaque morals and similar objectives. And Warren Vidic lasted through the first five games as sort of a big-bad. But the newer games seem to have abandoned this structure by trying to make every villain seem either horrenous or morally ambiguous, and never spending enough time on them. Black Flag and Unity both had extremely forgettable villains. I will give Rogue a pass on this one because you play as the villain. The series is obsessed with twists. I suppose this was to be expected in a series built on the Al Mualim twist and extended through the seriously impactful Minerva twist, but the modern games have become a series of minor twists that try to shout, “ARE YOU SURPRISED YET!” Surprise, he’s a templar. Surprise, she’s a templar. Surprise, you’re going to 1940. There are plenty of ways to make a story strong that don’t involve trying to pull the wool over your player, but the writers seem to have forgotten that. Instead, every one now must be surprisingly morally ambiguous, doing something for a reason we can only comprehend in their dying breath. The only way Syndicate will be able to surprise me now is if it doesn’t have a major twist that Jacob or Evie is a templar secret agent, or that some major villain we heretofore had reason to kill turned out to be an assassin or a family member. With it’s simple yet universal themes and interesting semi-historical contexts, Assassins Creed is a breeding ground for interesting narratives. It’s basically the video game equivalent or historical romantic fiction, and the possibilities for stories are endless. Not only have they barely touched Asian history (or African, or Middle Eastern), they also could potentially revisit places in different times (America in the 30s, London in the 70s, New Orleans in 00s, etc.). People will always want to kill people in different times. It’s a fundamental understanding of gaming in general. But Assassin’s Creed needs to recapture what sold the series in the first place: strong characters and a focused narrative. Stop splitting the characters into two or four, stop trying to tell sweeping tales of their entire lives from cradle to the grave (even Ezio’s story fumbled in his old age), stop try to surprise the player pointlessly, and focus on telling an interesting story with someone that we can care about. 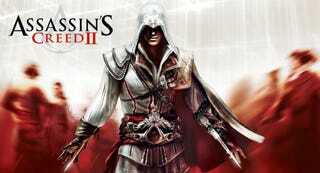 Then, hopefully, we’ll have the next Assassin’s Creed II.